Build Your Balls Build your Balls comes with 3 X 2.5oz meatballs with your choice of sauce. Optional choice of pasta will make it a filling meal, or even great for sharing. Comes with 3 x 2.5oz Beef Meatballs with your choice of sauce. Optional choice of pasta will make it a filling meal, or even great for sharing. Comes with 3 x 2.5oz Chicken Meatballs with your choice of sauce. Optional choice of pasta will make it a filling meal, or even great for sharing. Comes with 3 x 2.5oz Pork Meatballs with your choice of sauce. 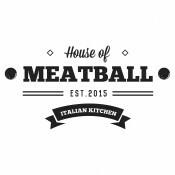 Choose which Pork Meatball you prefer, as well as an optional choice of pasta to make it a filling meal, or even great for sharing. Comes with 3 x 2.5oz Lamb Meatballs with your choice of sauce (Chilled or hot Lemon Dill, or any of the Italian sauces go great!). Optional choice of pasta will make it a filling meal, or even great for sharing. Comes with 3 x 2.5oz veggie-meatballs with your choice of sauce. Optional choice of pasta will make it a filling meal, or even great for sharing. Typically allow a few more minutes to prepare. Fixed Ballers Perfect combinations already paired together for you! Each Fixed Baller comes with 3 X 2.5oz meatballs plus a perfectly paired side. Chicken meatballs covered with marsala sauce over our Golden Mashed Potatoes. Spicy Pork Sausage covered with Traditional Italian Romano sauce, over our Creamy Polenta. Spicy Thai Pork Meatballs over Garlic Jasmine White Rice, includes our Thai Lemon Manow Dipping Sauce on the side. Very Spicy! Just like being at the ol' Steak House with all the goodies (Beef and Grilled Onions) mixed into these fabulous meatballs, covered with HOM's Steak Sauce. Bold meatballs with a steak burger taste! Our succulent Beef Meatball, mixed with bacon and cheddar, over HOM's truffle mac & cheese. Our tender beef meatballs, covered with Smoked Mozzarella, over our Golden Mashed Potatoes. Greens Fresh organic and local produce. Great by itself and even better with a meatball! Organic mixed greens, cherry tomatoes, toasted walnuts with a raspberry vinaigrette. Crisp romaine lettuce, parmesan and toasted croutons, with our homemade caesar dressing. Organic mixed greens, topped with gorgonzola cheese crumbles, walnuts, dried cranberries, cherry tomatoes, granny smith apples with our Vidalia Onion Dressing. Sides Yummy sides that pair perfectly with the meatballs and salads. Sweets Perfect compliment to your meal - especially those with a sweet tooth! Specials Weekly specials. Check back often for weekly menu items and specials. Sometimes these items can only be ordered at the restaurant. Italian Bolognese Red Sauce, served with 6oz of Spaghetti. Comes with a couple slices of toasted garlic sourdough roll.